Water/Drainage Archives - Charles Buell Inspections Inc. The futile business of cleaning gutters. 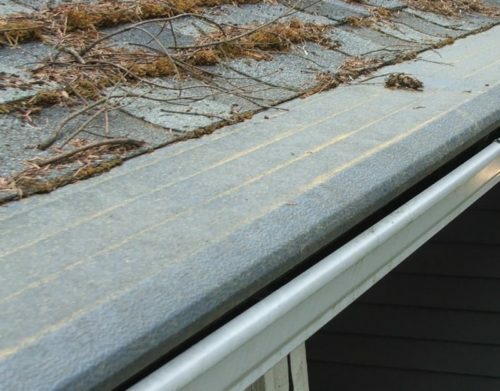 As long as people insist on not installing gutter-guard systems on their homes, the gutters will insist on regular maintenance—and even then will still require some maintenance. So what does “regular maintenance” look like? Certainly not like the following picture. The amount of maintenance necessary will depend on lots of factors. 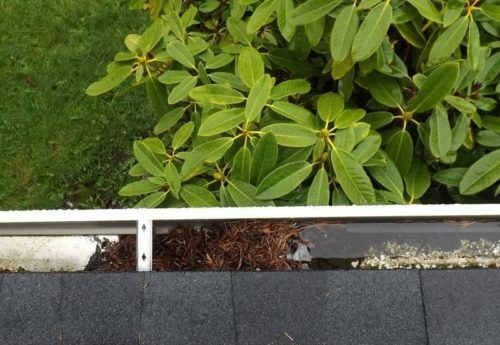 The types of vegetation present that will fill the gutters, how long it takes for this to happen and seasonal loading for some kinds of vegetation around the home—and of course kids and dogs. It is amazing the kinds of stuff I find on roofs and in gutters related to either being tossed by kids or from things being tossed for dogs to chase. 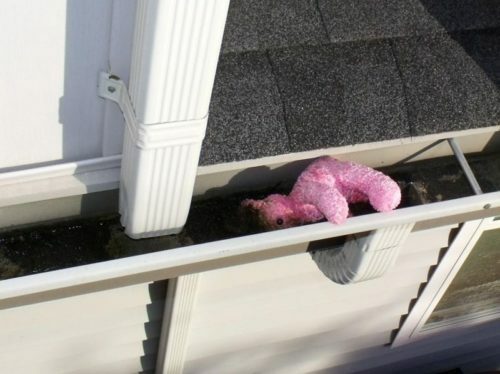 Hopefully nobody really expected the dog to get up on the roof. I was actually surprised in the picture above that the ball apparently did not float out of the way. While some dams might be constructed of bricks they should not be used to dam up gutters. In some cases cleaning might be required every month—for some homes once a year might be enough. 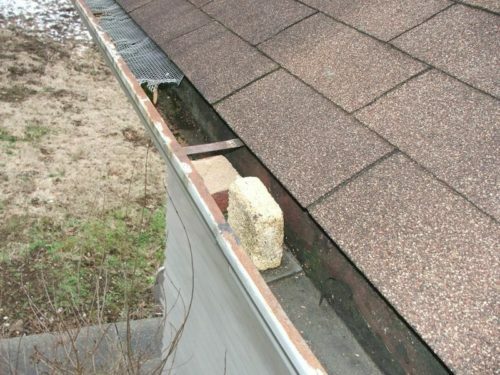 I know that if I had to clean mine every month I would be thinking really hard about installing a gutter guard system. 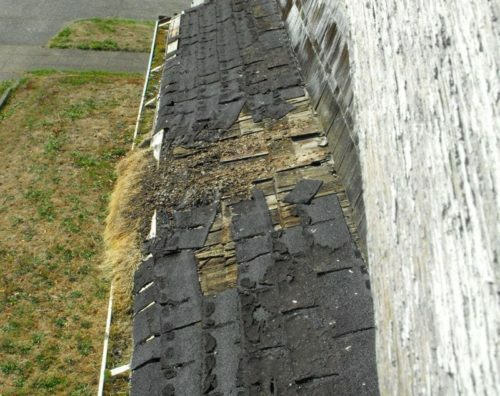 As you can see in the following pictures it does not take very much debris to completely dam up a gutter. 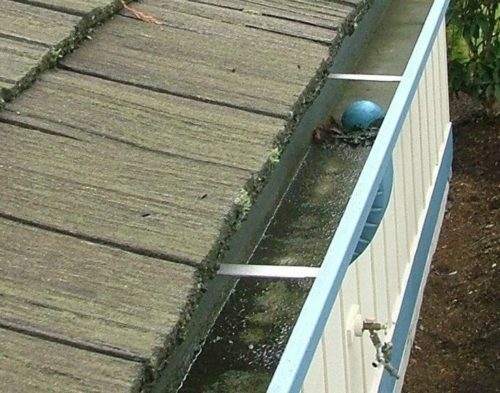 Overflowing gutters defeats the purpose of the gutters—which is to collect it, send it down the downspouts where it can be directed away from the foundation (either above ground or below ground). Why do I have SO MUCH condensation on my windows!? This is a great time of year to talk about indoor moisture. Because we keep our houses more closed up in the winter (unless you live in an area that needs a lot of air conditioning and you keep the house closed up year round) moisture can build up in the warm indoor air. Warm air can hold moisture until it reaches saturation and then it will start to give up that moisture to the cooler surfaces around the home. Take for example this metal screw that attaches the front entryway door pull handle to the face of the door. The staining and moisture is because there is way too much moisture in air at the interior of the home and it is condensing on the cooler metal. 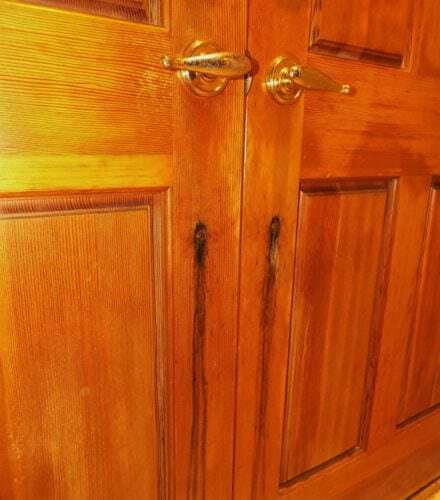 It is bad enough that water runs down and stains the door. While a little fogging of windows is normal during incidental “steamy moments” like when you do the dishes (does anyone besides me really do dishes by hand?). 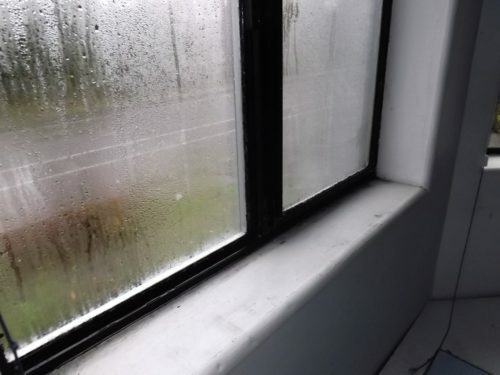 If you have condensation on your windows to the point that it starts to run down the glass–YOU HAVE A MOISTURE PROBLEM! 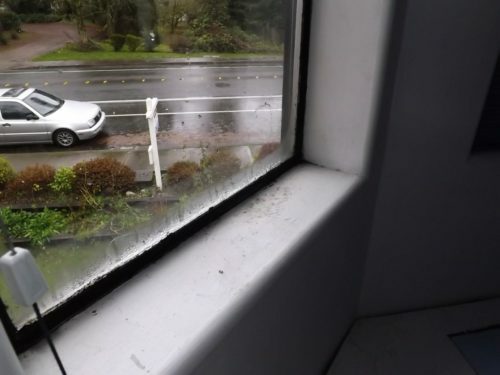 Your windows certainly should NEVER look like the one in this picture–all that moisture and mold is in the living space–not between the panes of glass. You don’t really have to wonder if you have a moisture problem when your windows look like this–you do have a moisture problem. The next thing will be figuring out why and then doing something about it. 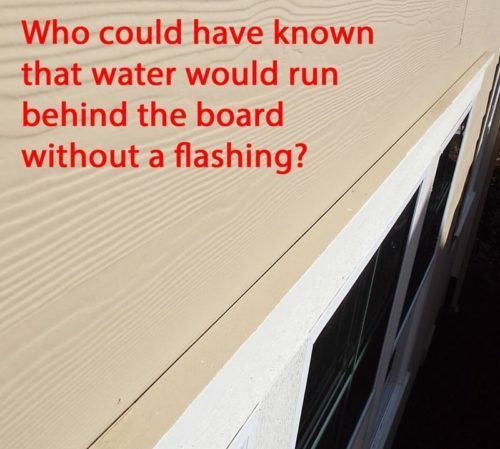 There can be SO many causes of excess moisture in a home that it will not be the purpose of this post to go into great detail about the many causes. This post instead will be about what you can try before you call in the big guns to figure out what has gone wrong with your home. In the majority of cases it is not the house that is the problem at all–it is the occupants of the home and the fact they do not know how to properly operate the home. Some people’s lifestyles are more problematic than others. 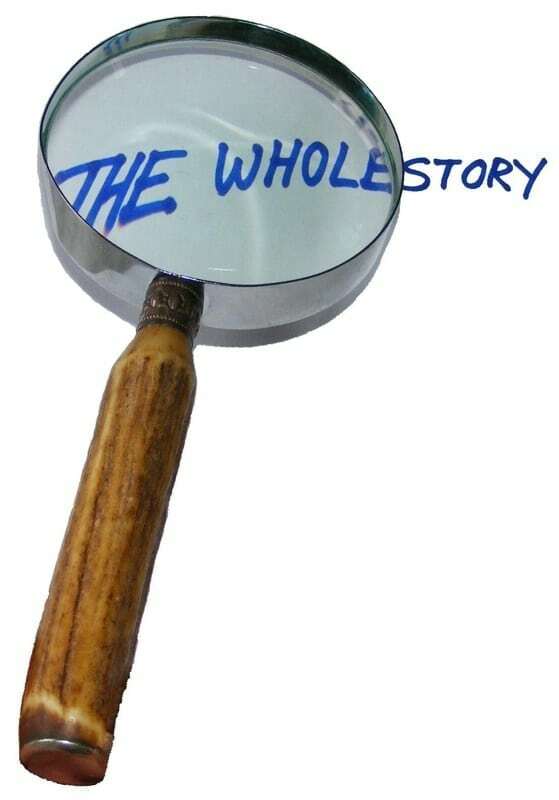 If you diligently do the things I suggest and the problem does not go away–then you will likely have to consider other causes that are more related to problems with the house itself. 1. Open curtains and blinds at least a little bit every day. While it may waste a little energy, you don’t want the air that gets trapped behind the curtains to give up its moisture to the cold glass. Adequate circulation of air will prevent this. Condensation is especially problematic in bedrooms that people tend to keep cooler and tend to keep curtains drawn tighter for longer periods of time. Anyone that has slept in a tent in the cold is aware of how much moisture our bodies give off when we are sleeping. Keeping the entire interior of the home at close to the same temperature is recommended as rooms left unheated will collect the moisture out of the surrounding room’s warm air like a magnet. Because it cannot hold the moisture, it will store it on the windows and the cold walls behind all the storage boxes in the room. For example if you have block-out blinds or Venetian type blinds–leave them raised an inch or two to allow for air flow to the glass. 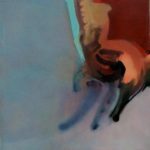 Take a look at these two pictures. Same room, same humidity and temperature levels. The first one is the results of condensation with the blinds closed, the second one with the blinds open. 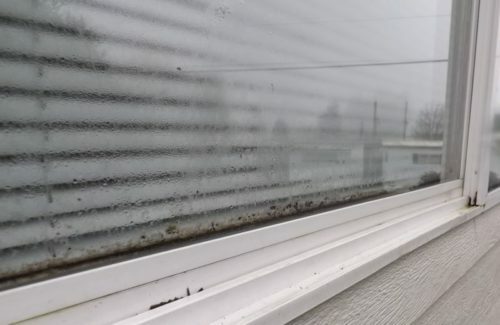 While there is still a little bit of condensation of the glass, consistent with moisture levels being too high, leaving the blinds open prevents a worse build-up of moisture. 2. ALWAYS, run the bathroom exhaust fan for at least an hour after every shower. If you have a way of warming the bathroom into the upper 70’s for a few minutes prior to taking a shower, the warmer air will hold more of the moisture from showering and can then more easily be exhausted during and after showering. If you have condensation running down your mirror or the bathroom window after showering, you are not using your bathroom properly. And another thing–get rid of those dang water saver shower heads that atomize the water making the water easier to disperse into the air. There are other types of water saver shower heads. 3. ALWAYS, use the kitchen range hood while cooking and for a few minutes after cooking. Always use the kitchen fan when the dishwasher is running or even while you are washing dishes by hand. 4. No Grow-ops in the house—legal or otherwise. A few house plants will not cause a problem if all other things in the home, including the inhabitants, are behaving properly. 5. Make sure the laundry exhaust fan is used while doing the laundry. If you don’t have a laundry fan–consider having one added. Modern construction would require one. Another thing about the laundry is that if the exhaust duct is restricted enough to increase drying time, more dryer moisture will find its way into the home. Making sure that the dryer is behaving properly is important in maintaining proper moisture levels in the home. 6. Don’t hang laundry to dry indoors. 7. Make sure that all exhaust fans are functional–just because they turn on and make noise does not mean they are doing the job they are there to do. A simple test is to cover the entire grill with tissue and see if the fan uniformly holds the tissue in place. Make sure you do this test with any doors to the room closed. Doors with inadequate clearances for air to move into the room as the air is exhausted may render the fan non-functional. Improving clearances may be necessary. Another test is to put the tissue on the floor near the bottom of the closed door and then turn on the fan–the tissue should be forcefully sucked into the room away from bottom of the door. Really tight homes may want to think about whether the whole house has adequate means of bringing fresh air into the home when exhaust fans are operated. All of this can be further complicated by not having direct vent gas appliances. 8. 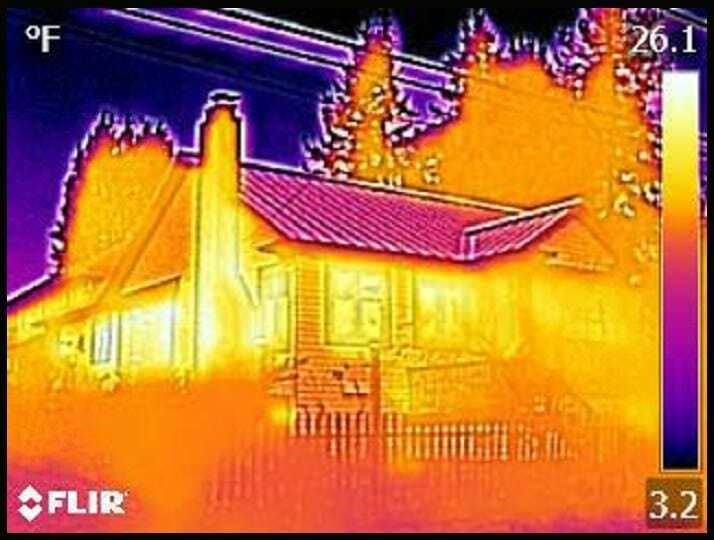 If you are going to cook and bathe in your home it is imperative that you maintain an indoor air temperature above 65 degrees F. I know we all have energy consumption considerations but if you keep the home at 64 degrees (or areas of your home at 50 degrees) and save $200.00 a year in heating costs and cause $2000.00 in water damage you have not accomplished much in terms of saving money. Health costs may also be affected as keeping homes cooler may result in poor indoor air quality conditions. This cost/benefit ratio is even worse if we are talking about keeping isolated portions of the home cooler. Just heat your home–it will reward you for it. 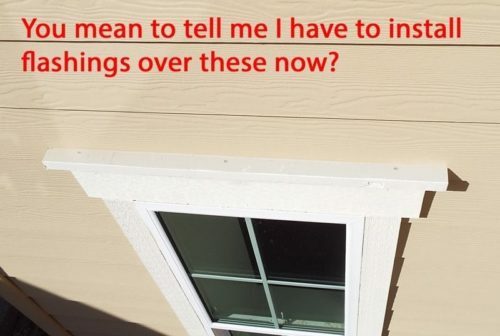 So, try these things–if you still have nasty looking windows like in the picture above–call a qualified home inspector or indoor environment specialist to figure out what is going on.